Somehow I ended up buying 3 shampoos in the past few weeks! 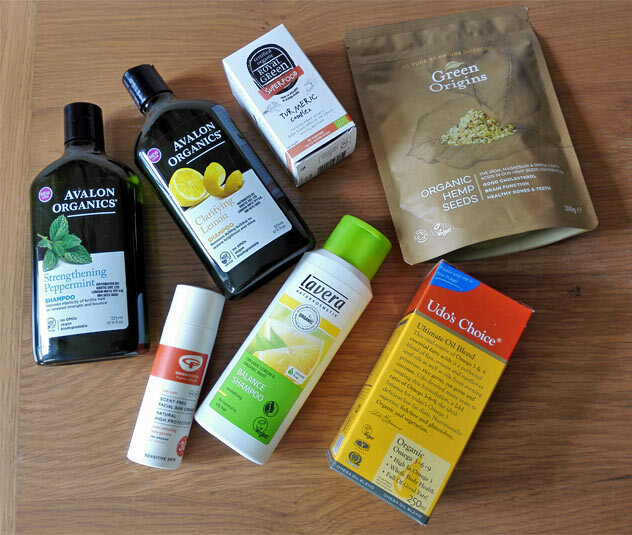 I also bought some new health products which I haven’t tried before such as Ultimate Oil Blend from Udo’s Choice and Royal Green Turmeric Complex. I’ve never tried anything from Avalon Organics before but Holland & Barrett were doing an offer and I decided to give this brand a go. I bought their Strengthening Peppermint Shampoo which improves elasticity of brittle hair, and I also bought their Clarifying Lemon Shampoo which claims to restore hair brightness and shine. 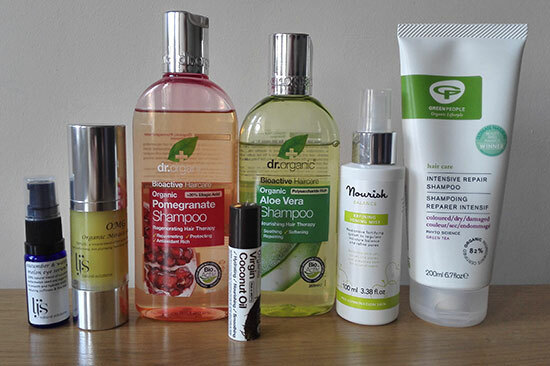 These shampoos contain no GMOs, parabens, synthetic colours, SLEs or phthalates. They are certified cruelty-free and suitable for vegans. I ordered Lavera’s Balance shampoo before I saw the buy one get one half price offer in Holland & Barrett. This shampoo is one of my favourite natural shampoos so I keep re-purchasing it. It smells really nice, I love it! I bought this facial sun cream from Green People for my fiance actually after I saw Carrie recommending it on her blog. My fiance hates all the natural sun creams as they make his face white but not this one. It’s pretty good actually and I am glad I bought it. I will write a full review in a separate post soon. Recently I’ve been suffering from some back pain and I’ve been trying everything to fight it off. I did some research and discovered that one of the best natural remedies for this kind of pain is turmeric, ginger and black pepper combination. I made this as a drink with hot water, some honey and lemon. It’s a really weird drink which doesn’t taste great but it does help. If you have any kind of inflammation in your body or joint pain, this is the potion I highly recommend. However, I made my life easier and I bought myself Royal Green Turmeric Complex which contains all the spices in a capsule form. I prefer taking this than actually drinking a weird concoction. It doesn’t come cheap but for me it’s worth it. I saw Udo’s Choice brand mentioned in few places before so I decided to give it a try. I bought their Ultimate Oil Blend which contains omega 3, 6 and 9 fatty acids. The blend is certified organic, it’s fish-free and gluten-free. It’s also certified vegan. The blend is formulated to contain an ideal 2:1:1 ration of Omega 3, 6 & 9 fatty acids. These are important for the body to function optimally. I couldn’t resist buying a pack of organic hemp seeds from Green Origins after I saw the brand on BodyKind website. So far I’ve tried so many different brands who sell shelled hemp seeds and I just really wanted to know whether this brand is better than Linwoods, who really are the best. I can now tell you that Green Origins’ hemp seeds are not better than Linwoods’. I found a few shells in there which I wouldn’t find in Linwoods’ product. What natural health and beauty products have you bought lately? Have you tried any of the products mentioned in this post? *This post contains affiliate links (if you purchase something after you click on a link, I will get a small commission which will help me maintain this website). Thanks for sharing these! I want to turn to vegan products so now I know where to find them. I am glad you found it useful Corinne! Lots of the products I use are certified vegan. I never use products which are tested on animals. I am happy to hear you love my picks Angie! Turmeric and ginger combination is great for fighting inflammation and any pains you may be experiencing. It really works for me and I love Royal Green Turmeric Complex as I don’t have to taste anything and I still get the benefit. I am definitely buying it again in the future. I’ve recently started adding hemp seeds to my oats along with chia seeds to try and make the meal a complete protein – not sure if it’s the right approach? I also bought some hemp protein powder recently from Bodybuilding Warehouse but the taste was too strong for me. Have you tried Green Muscle hemp powder – it’s organic and from the UK and supposed to taste nice? I’m also on the look out for better omega 3 supplements as I’ve got a few joint issues from training. Will have a look at those udos choice ones. I’ve also started taking glucosamine, chondroitin, and MSM to try and help my joints. Will see if they have any results! Still looking for something to help settle my gut as there’s something not right down there! Hemp seeds are great for adding extra protein to your meals, you are doing the right thing by adding them to your oats. I tried hemp protein powder once and I really don’t like the taste. I couldn’t eat it just like that, it would have to be added to smooothie or something. I haven’t tried the Green Muscle one, no. Maybe you are intolerant to some foods which are causing your gut issues?